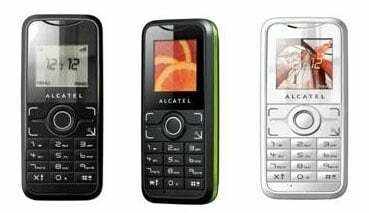 Alcatel has launched three candybar handsets that feature several ‘innovations’ designed to make general phone use easier than usual. The phones are the OT-S120, OT-S210 and OT-S211, and their refinements include rubberised keypads to make texting less troublesome - your fingers shouldn't slip off of the keys during rapid typing, for instance. The OT-S120 is the most elementary of the three basic phones, because it only sports a 1.3in black and white display. The two other models both have larger, 1.5in colour screens. All three phones are about 12mm thick and are claimed by Alcatel to be “palm friendly”. Each model is capable of dual-band GSM connections and will keep you chatting for up to five hours, the manufacturer claimed. But don’t expect too much in the way of entertaining features because the highlights are one game and a calculator. You can choose between a black or white body for each handset and optional summer-style trim colours can be added too, including "fuchsia pink" and "apple green". UK release dates or prices for the three Alcatel handsets haven’t been given yet.